Advanced formula ensures a smear-free finish. Free from abrasives - will not damage delicate surfaces. Ammonia free - pleasant and easy to use. •Simply spray on and wipe off for a sparkling finish. Janitorial: For all windows, mirrors, ceramic tiles, chrome and porcelain. In the office: Glaze is ideal for use on computer VDUs, its high level of purity helps prevent resoiling. Makes showcases and display stands, stand out. Automotive: For windscreens, mirrors, coach and bus windows, chrome and aluminium. N.B. 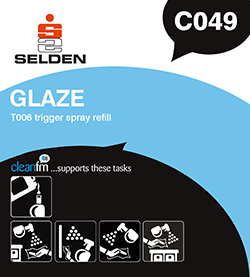 Glaze is a high purity ready to use product. Do not dilute. Apply sparingly and wipe off with a clean, lint free cloth or tissue. Do not apply in hot direct sunlight or near a naked flame. Never spray directly onto electrical equipment, always spray on to cloth and wipe off.